Zooey's character is like a paper cutout of a woman that some dude created and was like, �yeah, this is the perfect woman.' So flat. 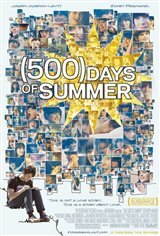 A good movie but unfortunate that it relies so heavily on the manic pixie dream girl trope rather than making Zoe's character more multi-dimensional. Smart, charming and touching romantic comedy. Joseph Gorden Levitt & Zooey Deschanel sparkle in this bright and interesting tale in the struggle to find a compatible lover. The music is exhilarating in this feel good film. Honestly, I was not interested in watching it at all when it came out. But everyone said it was great. So the other day I rented it and... I loved it! Such a good movie! A cute tale of love and... not love. Poor guy can't catch a break... For me it's the supporting cast who really make this movie shine though. Matthew Gray Gubler is exceptional! Great comedic timing on his part. He's always passionate about his work and this is no exception! 5 stars overall... 5 stars just for Matthew! Good acting , but the story was not that interesting.